Once your child becomes a toddler, you may discover how difficult it is to get him to eat nutritious foods. Eating habits of toddlers can be very tricky and burdensome. Toddlers surely have the choice whether to eat the food that you offer them or just toss it away. The power is all in their hands. How stressful this process can be! Your toddler may choose to eat tasty junk food which is definitely not good for his/her health. Are there any ways to change this? You need not to fret. There are some effective ways which will help you change your toddler's eating habits. Limit the number of serving that you provide to your toddler. Too many choices may not be good since it will only confuse your child even more. This may also be the cause of sudden tantrums and power struggle. Limit the sizes of serving as well. Avoid following the food serving suggestions that you usually find on food labels since those are mostly targeted for older children. Provide only one fourth of the suggested size of serving. Also, be firm in your approach. Be the one to make the right decisions and don't let your child pick from a variety of choices. For instance, you may ask him to pick between two types of fruit as a part of his meal rather than asking about what your child would like to eat for the meal. This way, your toddler will feel assured and guided and this will gradually develop his sense of preferences. Give him food only when he's hungry. Remember: do not force him if he doesn't want to eat yet. This could only lead to eating too much or too little. He may also not be able to develop the ability to recognize hunger cues. Once he's hungry, you will be able to feed him more easily and more appropriately. Provide only the most nutritious foods. Avoid any type of junk food. Your toddler's eating habits are changing as he grows up so you must be able to identify his needs properly. Try to introduce several types of healthy food repeatedly. 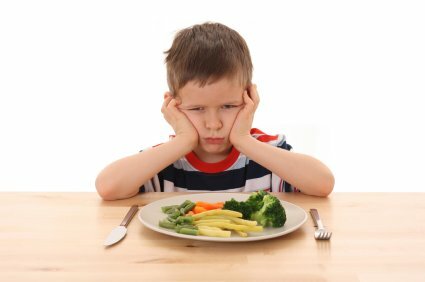 If your child doesn't like green, leafy vegetables, that doesn't mean that he will always dislike eating it. Just try and try until he gets to try it. You may include some of his favorite healthy desserts so that he will feel motivated to finish eating the vegetables first, then dessert afterwards. Be a perfect example. Of course, you cannot let your child see you eating some unhealthy junk food while he/she is eating some undesirable healthy food. Set yourself as a nice example to emulate. If you show your child that you always like eating healthy food, then he/she may try to imitate your habits and will also eat nutritious foods. Serve nutritious foods for your whole family. Now don't forget about table manners in your toddler's eating habits. Try to teach him important table manners while eating. This is important in developing a good eating habit for your toddler. If you have enough time, always accompany your child while eating. Don't leave him/ her eating alone. Changing toddler eating habits can be difficult but using the simple guideline above, you can easily do it in an effective way.